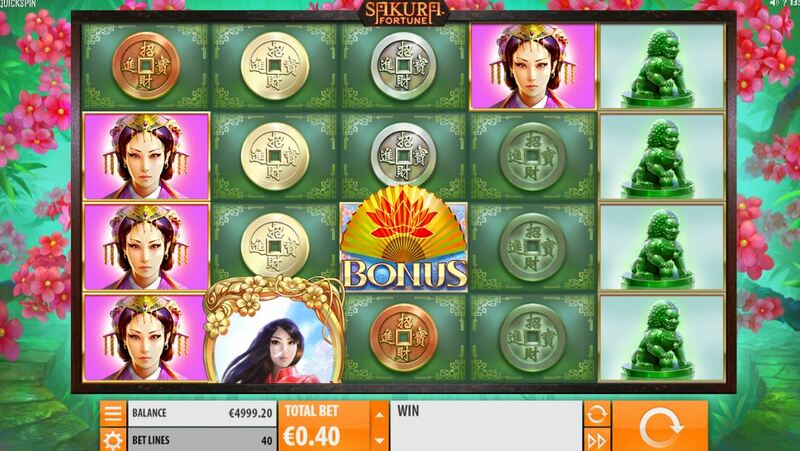 Sakura Fortune slot takes it's theme and name from the Japanese for Cherry Blossom and indeed the reels sit upon a background scene of Cherry Trees and naturally the musical score consists of soothing Japanese pipe tunes, with soft gongs when the reels stop. No doubt you'll want to know if Quickspin have delivered us any Eastern Promise with this game? There are 40 pay lines on this 5-reel and 4-row slot and in keeping with the theme was have Japanese icons and for a change no card values. The symbols can all appear up to 4 rows high so a full screen of any is possible. The best 5-of-a-kind is the Emperor at 10x bet, the Empress at 5x, the Warrior at 3x. 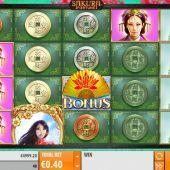 There is an Amber Dragon and Jade Buddha at 2x bet and the remaining icons are typical Eastern coins with square holes in the centre in 4 colours and pay either 1.25 or 1x bet for the 5-of-a-kind. The remaining symbol only appears singly and is a Yellow Fan which appears on all reels and will trigger the bonus when it lands consecutively from left-to-right. The Wild appears stacked on the centre 3 reels and has some mystical qualities. It doesn't multiply but when two appear in full you get two respins with them held in place. They take the form of a beautiful Princess in red silk and she has a surprise - she may be displeased when not showing her full beauty to players and thus if appearing in less than a full stack on any 2 or 3 of the centre reels, she may expand to fill the reels and trigger the respins! The Princess Wild hasn't finished with her generosity yet - she also substitutes for the Yellow Fan scatter so any combination of Wilds/scatters on 3 or more consecutive reels will trigger free games. You are awarded between 5 and 10 but have three enhancements: the Princess doesn't have to appear on 2 of the 3 middle reels to expand but only any one. Then she becomes a sticky Wild reel for the remaining spins and lastly, unlike the base game she will always expand. You can't retrigger the spins but when one, two or three appear you'll get that amount of extra spins. Essentially it's similar to the bonus round of WMS's Black Knight 2 slot but with up to 3 extra spins.